One should always work – whether you are a policymaker or a citizen – and then the improvement of one will entail improvement of other, and everyone will develop eventually. This, intuitively, does not sound like a rocket science. Now I know there exists such theory and historical data, approving it. Let me start from the very beginning. Today in the morning there was an opportunity to talk to James Robinson, one of the “Why nations fail” book, in Kyiv School of Economics. About the main idea of the new book “Balance of Power: The Race between State and Society”. For sure, the most interesting part is about dynamics. In other words, if is it possible to switch from the quadrant of “low capability of the state and narrow distribution of power in society” to the desirable situation of “capable state + significant distribution of power among citizens”? 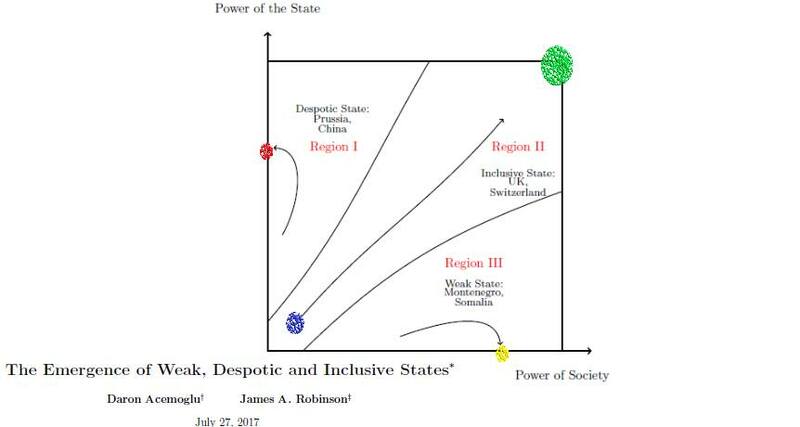 Acemoglu and Robinson in their work “The Emergence of Weak, Despotic and Inclusive States” (2017, https://bit.ly/2N3a9K3) showed, that there existed three equilibrium points and three respective dynamic sectors, containing the points. Depending on which sector the initial conditions belong to, the country may reach this point in the process of evolution. These points have been depicted in the author’s figure: yellow — weak state, significant distribution of power among citizens (for example, Somalia); red — powerful state, insignificant distribution of power among citizens (for example, China); green — the USA, countries of Northern Europe. Good news: although Ukraine is at the bottom, that is in “the worst quadrant”, it nevertheless is in the most promising dynamic sector! Blue point. If we work on building a powerful state (which has to restrain a powerful society) and a powerful society (which demands a state to be capable), – we will have a bright future. James Robinson objects to classical modernization theory, asserting that positive correlation between economic development and democratization is evident at very long periods of time. In addition to that, Robinson states that data contradicts views of Fransis Fukuyama regarding the fact that democratization follows the building of a powerful state (Income and Democracy, 2008, https://bit.ly/2Kc6Qma). Q&A session. The discussion on the US Constitution and Trump was interesting. For instance, regarding checks&balances: “American institutions are designed with Donald Trump in mind”. It characterizes stability of democratic institutions in the US today. Populism is quiet natural and common phenomenon. The result of citizens’ voting for any policy matches collectively desirable outcome in the zero set, that is nearly never. On Brexit. Policy makers have focused attention of society on issues regarding symbols, but not on real problems. The same goes about Trump: he manipulates symbols (Tymofii Mylovanov’s incentive to firstly resolve the issue with symbols, but not with problems came to mind in this context). On oligarchs. There is no sense in fighting them, since “elites reproduce themselves” – new ones will occupy their places (for instance, Zimbabwe). Instead we should turn their insectives to socially desirable and convert this oligarch problem into solution. So, James Robinson thinks that Ukraine has a potential to develop in the direction to “powerful state+powerful society”. This is, indeed, our goal and our sole way of being. Therefore, let’s get down to business. Even economic theory is on our side.